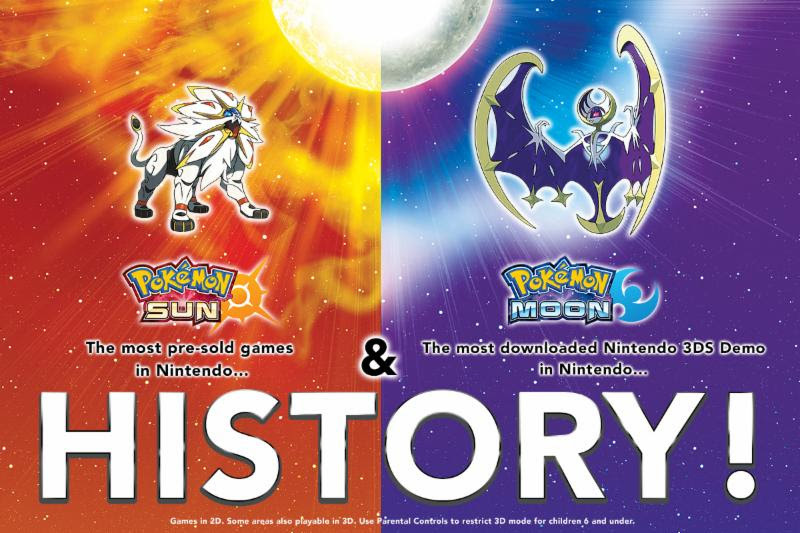 Nintendo announced that Pokémon Sun and Pokémon Moon are officially the best pre-selling games in Nintendo history. Additionally, the Pokémon Sun and Pokémon Moon Special Demo Version is the most downloaded demo on the Nintendo 3DS eShop in Nintendo History! With the launch of the first Pokémon video games 20 years ago, the Pokémon brand quickly became a global sensation and hasn't left popular culture since. The Pokémon brand's 20-year celebration in 2016 has ignited fans' passion for the beloved franchise across the country and around the world with a wide variety of initiatives and new launches. As part of this banner year for the iconic franchise, video game players are no doubt anticipating the launch of the upcoming Nintendo 3DS games, Pokémon Sun and Pokémon Moon, on November 18.